Over the past several decades photography has earned a hard won respect by being—among other things—universally acclaimed as the final word on the documentation of reality. Museum-scale exhibitions are devoted to photographers as a matter of course and city-wide events, such as Cincinnati’s recent Fotofocus, hail its ever growing list of achievements. But now, with its induction into the pantheon of fine art assured, the photograph is once again under-siege. Just as the advent of the daguerreotype challenged the soul of painting in the nineteenth century, the computer and its attendant digital technologies are fundamentally altering the parameters of photography in the twenty-first. 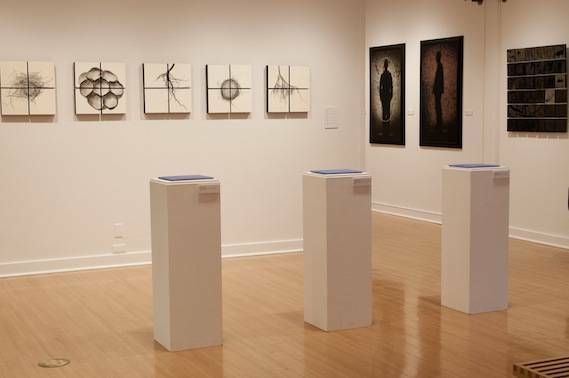 Shift, now on view at the Parkland Art Gallery, explores this transformation. Featuring eight artists and 48 works assembled by curator Peggy Shaw, Shift presents not a single traditionally printed image, with several revealing just how unstable lens-based media have become. Many of the show’s best works cannot be said to be photographs in any conventional sense but, rather, use photo-based processes as a starting point that lead in interesting—if not unprecedented—directions. Using wet plate collodion tin types—a nineteenth century process I won’t even attempt to explain—S. Gayle Stevens’ work depicts all manner of silhouetted plant and animal life arranged in grids of various sizes. Making an oblique reference to Cabinets of Curiosity, the hushed monochromatic tones of works such as “Spring” and “Wilderness of the Sea” are intriguing. But, ultimately, the most compelling moments of her works, like the delicately portrayed skeleton of a tiny mammal, are overwhelmed by the sheer volume of visual information presented to the viewer. While Stevens’ pieces inundate the senses, Christa Kreeger Bowden’s encaustic and digital print on panel works are spare, almost minimal affairs. Scanned images of “Roots” and “Nests,” metaphors for domestic spaces and desires, seem to float in an ethereal space of pure white. With an unobtrusive beauty, these smooth, gauzy surfaces allude to painting and only peripherally register as being photographic. Even the most spectacular examples of photo qua photo in Shift, such as Sonia Thomsen’s multi-paneled rumination on economic and ecological collapse, “Petroleum,” or Joyce Lopez’s oddly seductive examinations of dead birds, appear to be more than the standard-issue digital c-print. “Petroleum” in particular comes across as a dynamic relief sculpture, with its subject’s bubbling black ferment seeming to leap off of the surface. 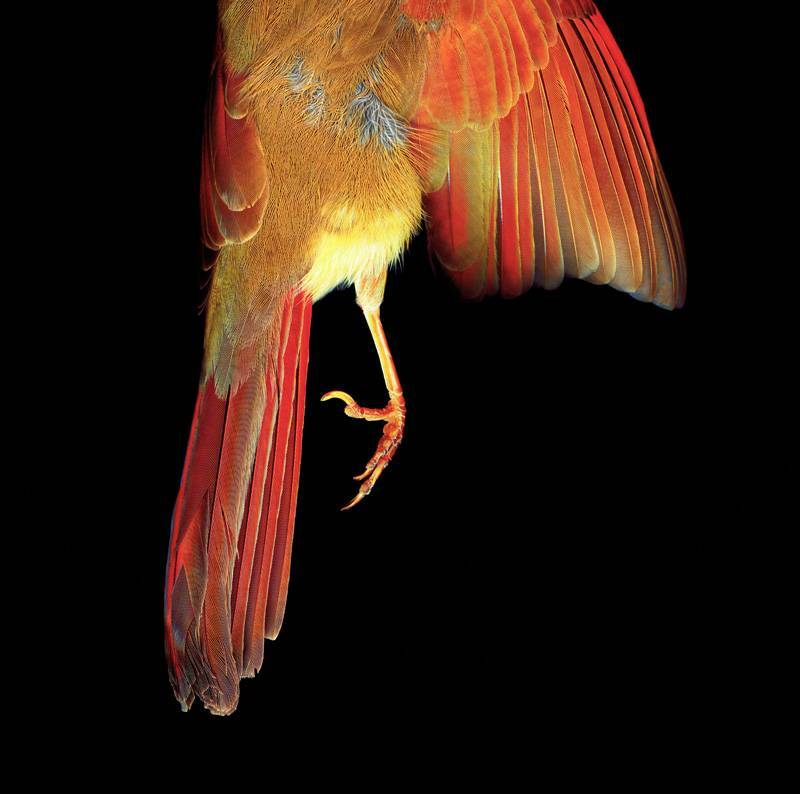 While Lopez’s six macro-images reveal with astounding clarity a Cardinal feather’s minute detail and the paper thin veil between the living and the dead. 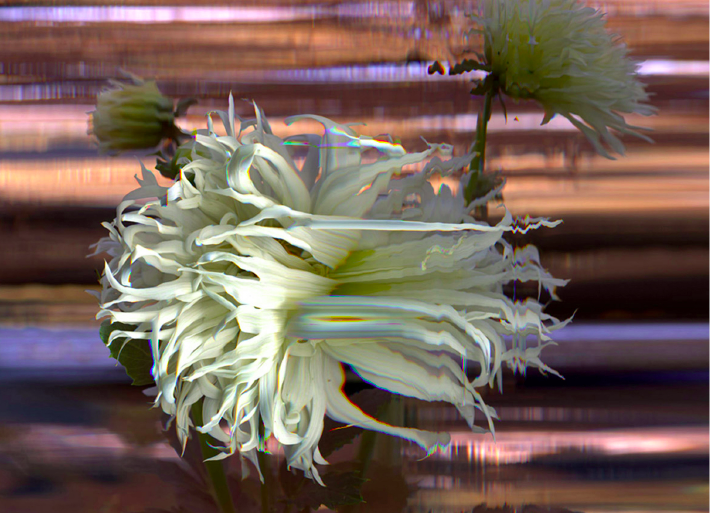 Employing a repurposed digital scanner to create his luminous but distorted ‘pictures’ of garden flora, Cleveland-based artist Bruce Checefsky’s work represents the tip of the spear in terms of the computer’s impact on photography. More so than any of other pieces in the show, the errors, glitches, and between channel-like defects inherent in Checefsky’s stunning images call attention not to their supposed subjects—ornate flowers—but to the medium’s evolving binary character. Video, photography’s oedipal son, also makes an obligatory appearance in Shift. Thomsen’s “Burning Water,” a four-minute moving complement to “Petroleum,” exhibits a studied fascination with the rhythms of water, oil, and surface. Accompanied by an audio track that draws from news clips discussing, among other things, the intrinsic dangers of drilling for oil, this 2007 work chillingly portends the Deepwater Horizon catastrophe of 2010. “Strange Attractors,” Michael Sherwin’s webcam quality three channel video, also alludes to our relationship with the natural world. With its time lapse videos of the arctic at solstice, ice floes, and glowing aurorae, “Strange Attractors” suggests, however vaguely, the unprecedented impact our actions have had upon the complex global climate system and our inability do anything about it. Also included in Shift are Dana Fritz’s documentations of Biosphere 2 and the Eden Project as well as Richard Gray’s microscopic investigations into the nature of human identity. Photography exhibitions are often accompanied by the faint anxiety of an inferiority complex. Perhaps it’s guilt, exercised like some sordid demon, over the fact that the process is just too easy. Unlike drawing or painting, which require endless hours of practice and patience to master, photography may yield aesthetically superior results as a matter of trial and error and in a comparatively short period of time. Historically, the physical nature of standalone photography is also problematic. Materials’ transformation, or more accurately, its transubstantiation, is an indispensible attribute of all fine art mediums. Marble becomes man, paint a believable space. But no such metamorphoses occur in photography. Sure, a complex set of chemical reactions allows a record of light to be fixed upon a sheet of specially treated paper, but that’s hardly Michelangelo carving David. The works in Shift, however, offer a vision of photography as something different: a wide ranging, and above all, proper medium. In several of these artists’ able hands, the photographic image is transformed, becoming a physical substance that’s part of a genuine act of materials engagement, leading the artist and the viewer to a result that isn’t simply the foregone conclusion of a shutter click, but a revelation brought on by the near-mystical interplay of forces that defines all art. 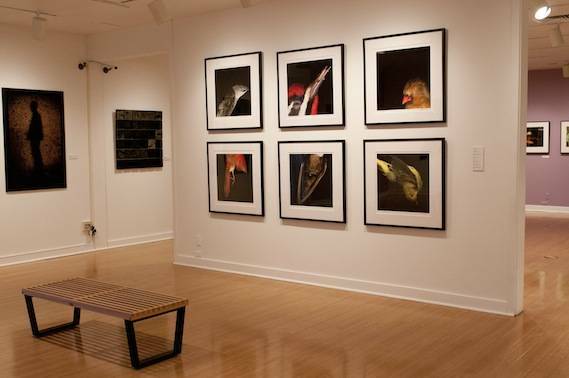 Shift is on view at the Parkland Art Gallery through February 2, 2012.